The AM 95x/x1x is a high performance single-width, full or mid-height, AdvancedMC™ processor module supporting the 3rd generation Intel® Core™ i7 processor and Mobile Intel® QM77 Express Chipset with up to 16 Gbytes of DDR3-1600 ECC DRAM. The AM 95x/x1x is designed in compliance to AMC.0, AMC.2 Type E2 (2 x Gigabit Ethernet) and AMC.3 Type S2 (2 x SATA ports). The module also features up to three USB 2.0 ports, two RS232 ports, two additional SATA ports, a x2 PCIe Gen 2 port, and two additional Gigabit Ethernet interfaces. 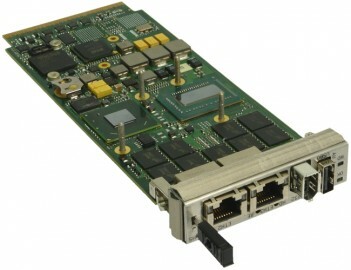 Supporting full hot swap and IPMI capabilities with a range of industry standard operating systems, the AM 95x/x1x is designed for use in AdvancedTCA® or MicroTCA™ applications in the telecommunications, scientific, and defense markets. Application examples include media-servers or blade-servers.